William Morrow Paperbacks, 9780062390998, 416pp. 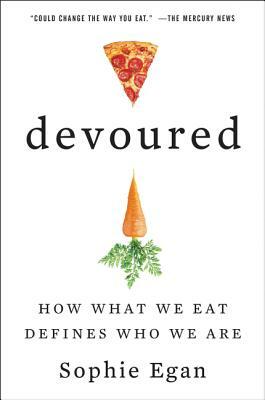 A provocative look at how and what Americans eat and why—a flavorful blend of The Omnivore’s Dilemma, Salt Sugar Fat, and Freakonomics that reveals how the way we live shapes the way we eat. Food writer and Culinary Institute of America program director Sophie Egan takes readers on an eye-opening journey through the American food psyche, examining the connections between the values that define our national character—work, freedom, and progress—and our eating habits, the good and the bad. Egan explores why these values make for such an unstable, and often unhealthy, food culture and, paradoxically, why they also make America’s cuisine so great. Egan raises a host of intriguing questions: Why does McDonald’s have 107 items on its menu? Why are breakfast sandwiches, protein bars, and gluten-free anything so popular? Will bland, soulless meal replacements like Soylent revolutionize our definition of a meal? The search for answers takes her across the culinary landscape, from the prioritization of convenience over health to the unintended consequences of “perks” like free meals for employees; from the American obsession with “having it our way” to the surge of Starbucks, Chipotle, and other chains individualizing the eating experience; from high culture—artisan and organic and what exactly “natural” means—to low culture—the sale of 100 million Taco Bell Doritos Locos Tacos in ten weeks. She also looks at how America’s cuisine—like the nation itself—has been shaped by diverse influences from across the globe. Sophie Egan is the Director of Health and Sustainability Leadership and Editorial Director at The Culinary Institute of America. Based in San Francisco, Sophie is a contributor to The New York Times' Well blog, and has written about food and health for Time, The Wall Street Journal, The Washington Post, Bon Appétit, WIRED, and Sunset magazine, where she worked on The Sunset Cookbook and The One-Block Feast book. She holds a master of public health from the University of California, Berkeley, with a focus on health and social behavior, and a bachelor of arts with honors in history from Stanford University. In 2016, she was named one of the UC Global Food Initiative’s 30 Under 30.